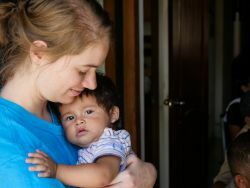 An American couple moved to El Salvador and created the organisation ‘El Vinculo de Amor’ (‘The Love Link’) when they took in a young baby who was malnourished. The organisation’s current director, Gerson Roque, used to be a volunteer on Logos ll - one of GBA’s previous ships - and welcomed a team of Logos Hope crewmembers as they came to help the organisation. The team introduced themselves to the families and children present, showed their country flags, the location of each country on a map, and introduced Logos Hope’s work. As the director gave the crewmembers a tour of the facility and arrived at the food storage, he explained that some children have specific needs when it comes to food, due to their malnourished state, or illness. He explained that he never has to buy the food. The food always comes from donations from other people, or from companies that give the food they are not able to sell. Gerson, who is a man of faith, believes that this is God’s provision for them. The organisation receives so much food that they are able to nourish the children, the families they help, and sometimes even have extra food they can donate to local schools. Logos Hope’s crewmembers were given various opportunities to serve the children who needed attention, care and love. The children received this love, but the crewmembers shared that they had received a lot on this day too.